For the first time in DTI history, this scenario does not take place in the Caribbean or the Pacific, nor does it include any pirates or British empires. This scenario is set in a fictional archipelago, dominated by three tribes; the Yamachians, on their island Duang-Zhe, the Wind Clan, in the rocky islands of the east, and the Uvirians, led by the fearsome dictator Ouvaldin. The story is centered around the last battle between the archenemies the Yamachians and Uvirians, and around a Yamachian commander named Kobai. Kobai is set to lead the defense of the island as Ouvaldin attacks with all his mighyt, to put an end to the war that has raged for a hundred years. Other differenses to the previous DTI installments are the .dat changes included, featuring amongst others a sort of tank, exploding cannonballs and catapult ships. Nothing advanced, but it adds to the experiense a bit. It also included .dll files, so that created units are renamed properly. Instructions on the installation are in the ReadMe. Enjoy the playing and good luck to the other contestants! 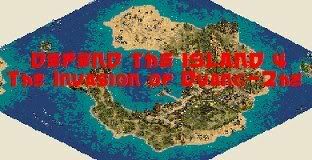 To download the previous 3 Defend the Island maps, go here. A bug. Something about your population/population limit is seriously messed up. I had to delete almost my entire army, most of my navy and all my villies to make room to train a transport ship to transport a cannon over and finish off their town centre. Other than that, quite good. I liked the music. What's up with the 'tank' btw? Just reinstall the game and it'll go back to normal. Jatayu, I have no idea of what's happening. Do you mean that the population is far higher than the actual number of units? Yes. I played it again (this time on hard) and I had around 50 ships, 10 soldiers and 5 villies left and my pop was still over 200. Had to delete stuff. "Error - File Header is Damaged"
This could present a problem for judging, unless someone knows how to get it to unzip properly? There is way too much going on to worry about economy.All I did was chop wood and mined some gold to get ships and I still won.Try to make the enemies smarter and make less of them.I had like 200 enemy ships(no joke)to the south of my base just sitting there.Give them alot less ships and more men on the ground just make the ships smarter.Do something like send waves of ships towards the entrance to the bay.Awesome map design,decent-good story,good balance,playability good though I complained pretty:) At the end just give the player regular galleons and just make it to where the enemy produces less galleons so it wont be so annoying clearing out like 500 enemy galleons.Keep up the good work. UPDATED REVIEW FOR NEWEST VERSION: (Note: the major problem with the first release was a population bug, where dying units still took up a population space; this has been worked around in the updated version). THe fourth installment in the DTI series, this one is undoubtedly the best. Set in a different place and era, this scenario brings a new feel to these Island defense scenarios while still offering the kind of DTS gameplay one would wish for. This scenario was incredibly entertaining to play. Most DTS scenarios give you a small base to defend, but this scenario sees your forces spread over a whole island fighting on all sides. This design leads to a back and forth, fast paced style of play which was really enjoyable. The time you must hold out is just about right to prevent the game getting tiring, while still lasting for some time. In the previous version, a point was deducted for a pop bug with the dat file. In the new version this has been fixed as the tanks no longer take any pop. While this adds the point back on, giving a five for playability, the scenario is now insanely easy. This is a tricky category, because originally I would have awarded a perfect score. Though I won it my first try, I THOUGHT it was very hard and I was close to losing it. After replaying, I discovered that even on hard the scenario isn't very losable; it just gives the impression of being difficult. You can do almost nothing and probably win 7/10 times or so. After the update to remove the pop bug, the scenario is now so incredibly easy on all difficulties that only a three at most can be awarded. Unfortunately, this is probably an AI issue, and writing a new AI would be a massive overhall. While a scenario so easy could often be given an extremely low balance score, I still give it average because the easiness does not affect enjoyment enough to ruin the scenario. As mentioned in the openning, this scenario takes a more creative approach to the series, with great results. The addition of dat editing, while not anything special, adds flavour and novelty to the design. The map design and trigger work all lead to a very original style of play. Everything is very well done and there is no reason for the deduction of a point here. As said before, good work on taking an old theme and reworking it. The map is designed well for gameplay, and the various island defenses are nicely, if not wonderfully, designed. The map on the whole is very solid, the unit selections are quite good, etc. While there is nothing truly special about this map, there certainly isn't any glaring mistakes. The design is significantly better than a random map, while still not being perfect, so 4 is the obvious score. Some areas that could use improvement include the surrounding sea (which could do with more mixing of terrains), and the enemies base, which is rather plain. But altogether a solid map. The story is very well done. To be perfectly honest, the story in small scenarios like DTS scenarios is really rather excessory and definitely not the focus of the campaign as it might be in an rpg or some such design. That said the story does a good job of doing what it should do: provide quick and easily understood background while seeming realistic, connect the gameplay throughout the scenario, and provide a good conclusion to the tale. All this was done well without interfering with the core of the scenario, its gameply. The instructions are all well written and clear. The objectives are clearly defined and the player is never confused. DTI4 was in my opinion the best entry in the DTSC, and was awarded as such. The score could be higher if the pop bug was fixed and the AI's were tweaked to provide more of a challenge. Still as it is, it is definitely worth the download. Good work. the is a .cpx file when it should be .cpn...can someone please tell me what is going on?